As far as the eye can see . . . .
A series of small fires erupted into a catastrophic forest fire in 1988, nearly engulfing Old Faithful Inn and other historic structures. Nearly 30% of the park was impacted by the fires which burned with such heat and intensity that much of the area remains a dead zone. Can’t see the forest through the trees . . . .
Twenty-seven years later, regrowth of the trees has not yet begun. 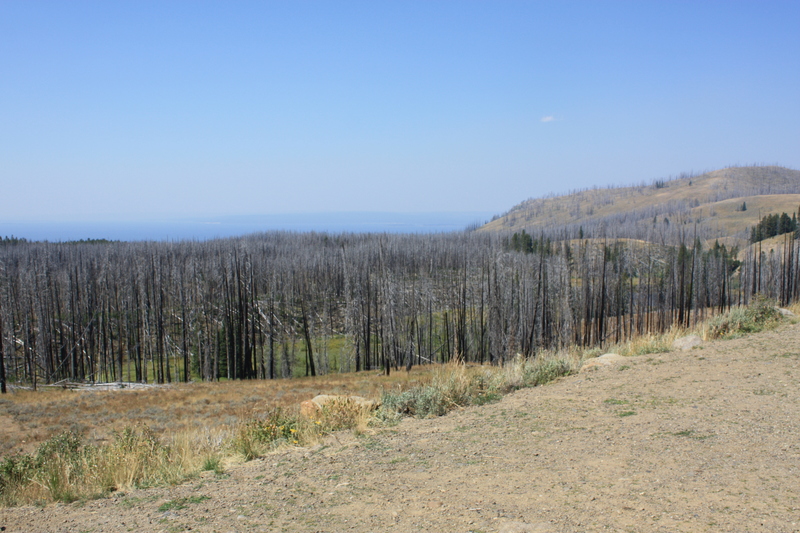 Volunteers and park personnel have planted thousands of replacement trees but the road leading from the north entrance at Cody, Wyoming to Yellowstone Lake is scarred by fire that burned so hot the seeds for regrowth were destroyed. 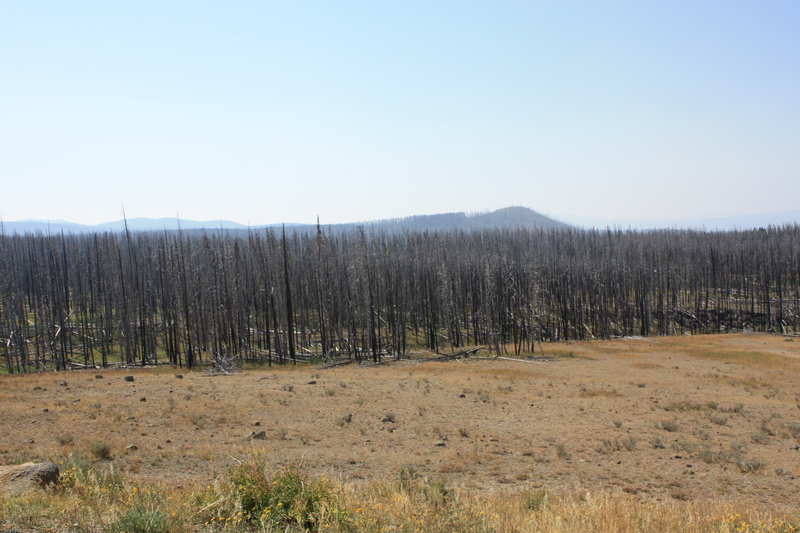 Bereft of wildlife . . . .
A public policy of suppressing forest fires for the past 100 years has left forests in the western United States thick with undergrowth and trees growing so densely that the fuel build-up is frightening. Add to that the curtailment of logging and thinning of the forest and you have a prescription for what is happening today in forests in Washington, Oregon, California, Idaho, Utah, Colorado, New Mexico and Wyoming. 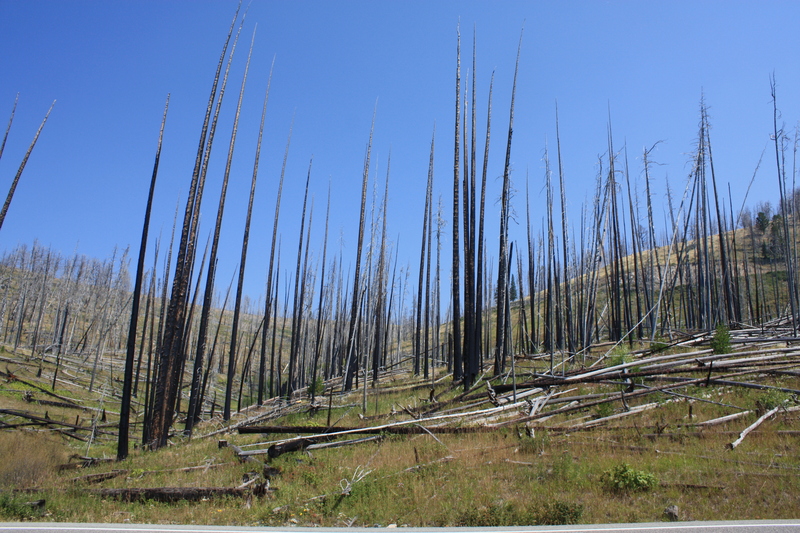 Miles of dead trees waiting . . . .
We entered Yellowstone from Jackson through Teton National Park. 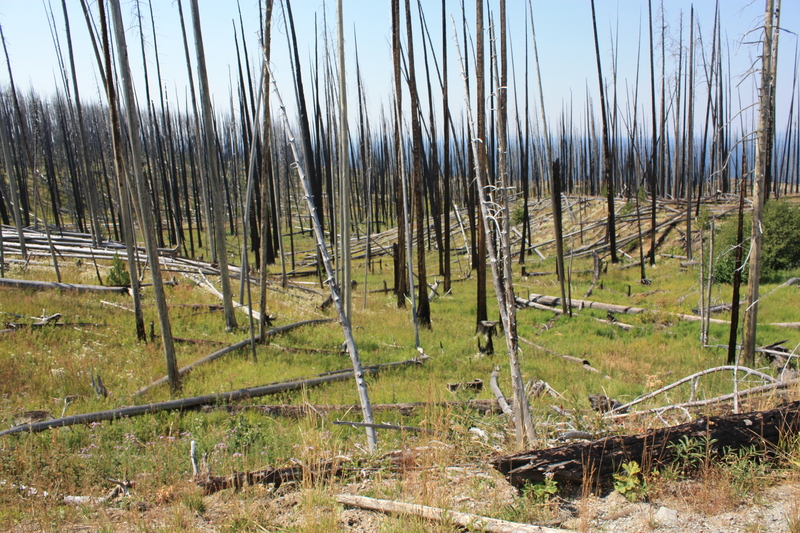 The devastation from that entrance is not so evident, however the old growth pines and spruce trees are nowhere to be seen and have been replaced by a furry vista of young trees growing so densely that in a few short years it will become the same potential disaster that Yellowstone strives to recover from. Is this the right way to preserve the forests in our national parks? This entry was posted in Worldly and tagged Yellowstone after fire by bygeorge. Bookmark the permalink.